The Humane Education Department offers tours of the Burlingame center for groups who are interested in learning about our work with animals. Up to 24 people at a time (including adults for children’s groups) can be accommodated. The tour guide starts with a discussion about our services, the different kinds of animals received, and ways people can help them. A walk-through includes seeing the dogs, cats, small and exotic animals up for adoption that day. We ask for $1 per tour participant. Tours last approximately one hour and are conducted on weekdays between 10:30am and 5:00pm by appointment only. For more information, please contact Kylynn Pelkey, Humane Educator, by calling 650-340-7022 ext. 369 or kpelkey@phs-spca.org. Celebrate your child’s birthday at our Center for Compassion! We host parties for 7-12 year-olds on select Sunday afternoons from 2pm to 4pm. Guests will learn about the animals available for adoption, get a behind-the-scenes shelter tour, and have a meet and greet with a friendly pet! Parties are currently booking up to four months in advance. Parents can choose from two different party packages listed below. To request a party at our facility, please call Tanya Nori, Humane Education Coordinator at 650-340-7022 ext. 308 or email at tnori@phs-spca.org and fill out an inquiry form here. 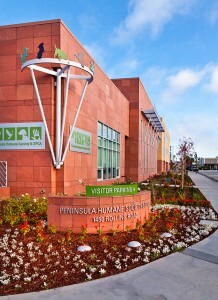 Hold your next meeting at PHS/SPCA’s Center for Compassion! Visitors describe our center as warm, inviting, inspiring…nothing like a typical shelter! And, we have meeting rooms for your work group, association or club. Small groups (up to 15) can use our conference room, while our Multi-Purpose Room can hold groups up to 95. We ask groups to give us five minutes at the beginning of their meeting to talk about our center and work. There is a small fee for the usage of our space. For more information please contact Buffy Martin-Tarbox at btarbox@phs-spca.org or 650-340-7022 ext. 343.